MORE RAIN: The sky is mostly cloudy across Alabama this afternoon with temperatures generally in the upper 50s and low 60s; some colder lingers over the northeast counties of the state. Temperatures will actually rise slowly tonight, and we should be in the mid 60s early tomorrow morning. We have some patchy light rain on radar this afternoon, but the more widespread and significant rain comes late tonight into tomorrow. An approaching cold front will bring rain, and possibly a few thunderstorms to Alabama from roughly 2:00 a.m. until 2:00 p.m. tomorrow. There is hardly any surface based instability, so no severe thunderstorms are expected despite decent wind fields. Rain amounts should be around 1/2 inch for most places, and the rain ends from west to east early tomorrow afternoon. Temperatures tomorrow will fall from the 60s in the morning, into the 50s by afternoon as the rain moves out and slightly cooler air filters into the state. WEDNESDAY THROUGH FRIDAY: Wednesday will be a sunny day; after an early morning low between 30 and 35 degrees, we expect a high in the upper 50s. Thursday will be dry as well; we warm into the low 60s Thursday afternoon. Clouds increase late in the day, and more rain will move into the state late Thursday night. Rain is likely after midnight Thursday night into Friday with another cold front and upper trough. Like the system tomorrow, for now it looks like there will be hardly any surface based instability for the system to work with, so severe thunderstorms at this point seem unlikely. Rain amounts will be around 1/2 inch, and temperatures Friday will slip from the 60s in the morning into the 50s by afternoon (like tomorrow). 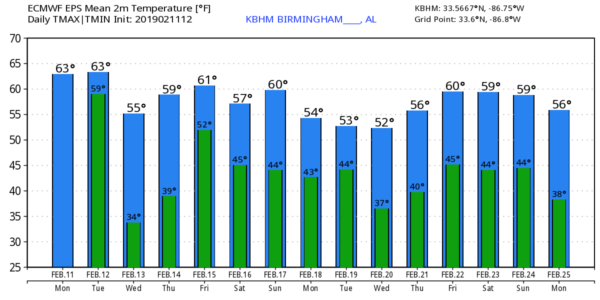 THE ALABAMA WEEKEND: Saturday will be a partly to mostly sunny but cool day with a high in the low 50s. Sunday looks mostly dry for now with a high in the low 60s, although clouds will begin to increase. Some rain could move into the state Sunday night as the weekend wraps up. NEXT WEEK: Snow fans love the 12Z run of the American global model (the GFS), which suggests some type of wintry mix for northern counties of Alabama Monday, Monday night, into Tuesday morning, but understand this is an outlier, and the reliable European global model has warmer thermal fields and just rain… and we will side with that solution in our forecast. See the Weather Xtreme video for maps, graphics, and more details. ON THIS DATE IN 1912: Heavy snow accumulated across North Alabama; totals included 7.3 inches at Scottsboro, 5.5 inches at Bridgeport, and 4 inches at Huntsville. I enjoyed seeing the second graders today at Grantswood Community School… be looking for them on the Pepsi KIDCAM today at 5:00 on ABC 33/40 News! The next Weather Xtreme video will be posted here by 7:00 a.m. tomorrow..